Its quite a shame for me to write something so angry after a long absence from the blogging world but at least this would let people know what really is going on, before more becomes a victim to this. Its funny how the worse thing that can happen to you would be at the place where you will never even think of it to happen. I have heard of so many stories of people falling victims to sham based companies, never thought I would see the day that it would happen to me. It all happened when I was going to pick up Miss Ave T and Cereal at their workplace in KLCC, which is obviously the normal routine that I would do on an everyday basis. Since I came out from work a little late, it was getting kinda dark around KLCC and naturally, I parked at the side of KLCC that time to get the girls, since I didn't want them to start walking around the area at night. In less than 15 minutes, I walked out of the car, came and get the girls, came back out to the car and to my horror, the car was gone. Knowing something must be wrong, I went around asking if they saw the car and one of the workers out there mentioned that the car was towed. Fuming mad by thinking that KLCC UrusHarta have started doing rouge works like this, I stormed to the nearest taxi stand (the taxi guys with the car above) to get a taxi to the KLCC Urusharta office. 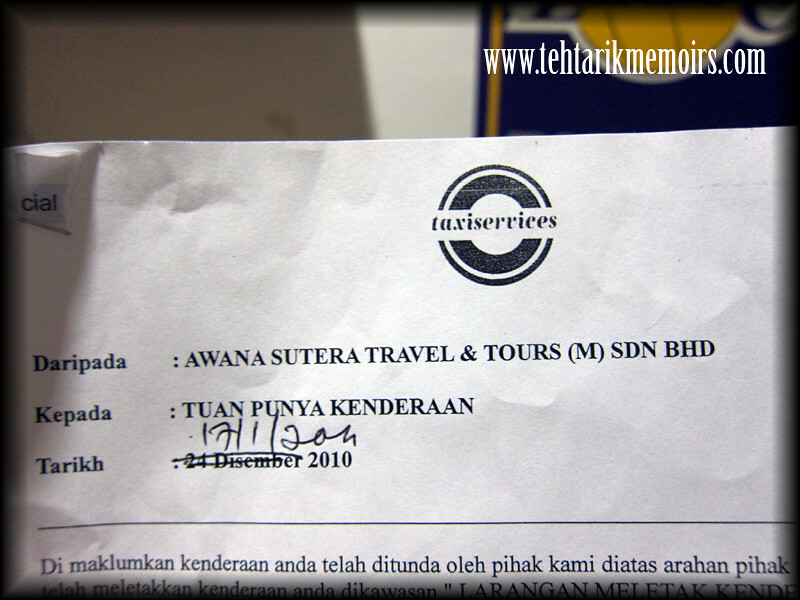 It was then I was told that it was not them that towed the car, but the TAXI COMPANY THAT RUNS THE SERVICE IN KLCC. So I made my way with the girls to get to the bottom of this and on the ride to their office (which is in a deserted area in Jalan Stoner) I got a lowdown from the taxi man himself. 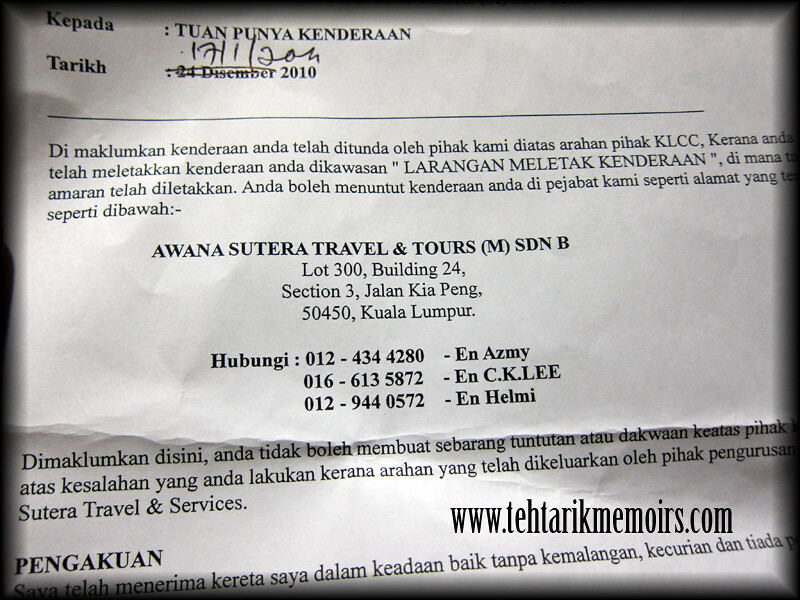 It seems to be that this company, Awana Sutera Travel & Tours have been getting a lot of bad rep with the public over the recent months for masking other "businesses" with their taxi services around KLCC. So many people, fallen victim to them like me, have complained and tried to take action but to no avail. Best thing yet, they are known to hire gangsters to do their bidding around town (example of story here to get their monopoly on the taxi services). Not wanting to believe in mere "heresay" stories, I came up to the office and wanted an explanation on why all this happened. Along the times that I argued my way through with the people, slowly one after the other the "men" started to surround us, looking at how we are handling the situation. From having no one at all at the place to suddenly having a few people surrounding our seats. I knew it was a shakedown and this was getting a little ugly. I asked the lady behind the counter (a fat old Malay lady who kept shouting at me the minute I started to win an argument) what would it take to get my car out, and she promptly replied "RM200 and to sign this letter, otherwise you're gonna have to stay here until you do". Now this comes to the interesting question, since when did companies like this are given the authority to impound cars, when even municipal councils no longer have the authority to do so? What amazes me that they blatantly convince those who were impounded to believe that they actually have the right to do so, seeing that most people would not know their rights out of panic in that particular situation. Most importantly, by using threats and gangsters are the way to go nowadays to get their business going? I did my own research about this particular company and found so many horror stories about the company and the owner of the company, ranging from company fraud, underground maid agency fraud, and even its own brand of gangsterism in their business. Perhaps this latest "service" of theirs is the latest in line to their products. Albeit the fact that the company's taxi services have brought in much control and benefit for the public, this is truly used as a cover up for what they do behind the scene. One of my main question is definitely to the owner of the company, who apparently "approves" of such tactics to be used under his name. As per my knowledge, the title "Datukship" is suppose to be given to those that have shown exemplary service to the public as well as contribution to the society of Malaysia. Is this the kind of action that is sanctioned by a man that holds the title, and the use of thugs, hooligans and gangsters as the means of their business? Perhaps this would be a grim reminder to all that reads this as how a company, so publicly seen in the city, can misuse their place in business and claim authority over others, by simply using "armed muscle" to make sure that no one questions their actions. As per this incident, I truly hope that no one else would have to go through this "back alley" tactics as how I had to go through. fat lady: "Ni nak tulis RM200 tak? adik bayar RM180 nanti boleh claim RM20 extra. me: "takpe makcik, saya taknak makan duit dengan cara tipu dan kenakan org lain." And then, I just gave her a sneaky smile. She went nuts. kuasa datuk sham akan kalah dgn kuasa rakyat,siapa bg kebenaran pd orang mcm ni,mesti ada kaitan dgn orang kuat petronas,saya dngar petronas bayar bulanan 60k sebulan untuk jg klcc pd datuk sham.tak campur duit bulanan kutip dari teksi dan 2 rm daripada penumpang.dato sham ialah orang kuat kroni petronas. kalau ada masalah di klcc kerana teksi,buat jela mcm sistem kl sentral,times sqare,kl tower,sunway pyramid,sistem kupon supaya rakyat pun senang ht dan pemandu taxi pun senang ht,buatla counter tempat masing2 hbs cerita,pelancong pun rasa selesa,orang tempatan kalau tak nak guna texi kupon blh jg ambil kat luar ,jgn paksakan penumpang supaya ambil texi executive sahaja,kami cari texi budget tak ada pula,kerana taxi budget tak suka sistem avana sutera kerana kena bayar bulanan dan beratur lama ,tapi suruh ikut meter dan rm2 di ambil pd penumpang masuk dalam poket dato sham,ini ke sistem kupon,menyusakan rakyat sj.ni lah saya kata 3m.maksud,bonserism,datorism,kronism. Hey you want more recent pictures of this con man? If you do I will give you my email. BTW he is not a Datuk lah! Hello, nice articel, me and my friends just had experience what u have been through.That gangster is really2 bloodsuck monster.Satu hari nanti this Datuk will get paid for what he has done to public.Even kakak or makcik2 tua merayu minta diskaun pun da orang tak kasi.Kurang ajar semua samseng2 nie...tapi x faham why Police,DBKL orr other authorities still keep quiet...damn! Benda yang sama baru berlaku kat saya malam tadi. Dia orang memang kurang ajar. Saya park sekejap tak sampai 1 jam belakang restoran pelita ns kandar sbb nk belikan roti bakar di pelita kat wife yg sedang dlm wad di sebuah hospital di jalan tun razak. Sekali kena clamp. Mmg diorg suruh byr rm200. Tapi sebab saya kerja Pe****** dia kata boleh kurang rm150. Makcik gemuk tu mmg kurang ajar dan biadap. Cakap tinggi suara dan tak hormat orang langsung. Tp lepas baca artikel no baru la tau siapa bos awa** sut*** ni dan taktik mereka tu mmg keji. Sedangkan majlis atau dewan bandaraya pun kompoun boleh merayu. Diorg ni dasar makan duit org. Keji! I have read your story and very interesting but i am wondering why you fail to lodge a police report agaisnt that lady,as far i am concern the company towing your car have is right cause being appoint by KLCC ( Contract In Place ) but the lady have no right to do what she is doing.Lodge report my advice to you. You dare to distribute ppl private information ha, you must be having a good lawyer backing you up behind you.My advice lodge police report if you think you are in right position. Nasihat saya buat laporan polis. I really do not understand you and the malaysian people when past 12 years budget taxi being acting rough and cheat passenger you al are not complaining when there is a system to protect you passenger you all are complaining.I just dont understand.Today KLCC atxi have serve better to the visitor to klcc and hassle free and clean area to use taxi at klcc. 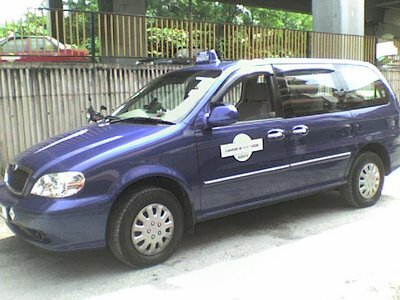 as mentioned in the post above that albeit the fact that the taxi services have improved rapidly in KLCC with this system however what I question is the legality of their authority on actually towing people out of the premises. Please bear in mind that under the Road Transport Act 1987, authorization of towing would only be given either to the police or otherwise auxiliary bodies that are approve and appointed by the police. on this matter, the problem happens when any pleas or complains against them are met with aggressive and rude behavior that either threatens or even appalls the general public who gets themselves in this situation, regardless if local or not. For your information after the incident I did make a formal police report (which I would not put it here for safety reasons) however I believe that this is still happening. What I question is, how long would this be overlooked and allowed to continue. What I question you is perhaps your would read thoroughly on my article before you start your sentence with "you and the malaysian people". Dah selamat kena tangkap dah dato palsu nie..ahaks..
KLCC taksi memang kurang ajar, not only like gangster, they are more like beggar. Just happened today 3.30pm, I saw 1 disable girl getting into public taxi who just drop the passenger in front of Suria KLCC. Immediately one guy with red uniform came arguing with the taxi driver, then he call his member with KLCC uniform demand for money. They force passenger to pay them RM2 or else have to have to get down from taxi. I really don't understand how it could be happened at KLCC. Is KLCC management blind ? Kita tak patut bersangka buruk. Tanya diri sendiri samada klcc itu public property atau private property.klcc dah sediakan lebih 10 ribu parking bay bawah tanah kenapa tak parking di situ. Jawapan nya tak nak byr duit parking.bila ambik tindakan semua salah dan awak saja yg betul.disiplin diri pun tak da lepas tu menghina org tak habis habis.